Those with a taste for the weird and wonderful might like to know that shoemaker Silvano Lattanzi has just dug up some handmade shoes that he buried four years ago. 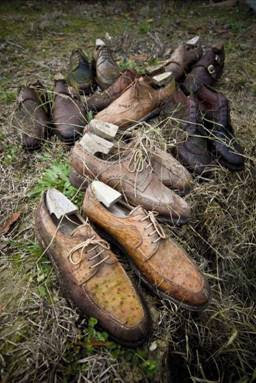 The 40 pairs were put in an ‘aging pit’ to give them an antiqued look. I’ve always preferred painting on undyed leather, but if you like the look go for it. They are named Scarpe di Fossa or entombed shoes. You can follow the discussion on Shoes with an earthworm patina by entering your email address in the box below. You will then receive an email every time a new comment is added. These will also contain a link to a page where you can stop the alerts, and remove all of your related data from the site.